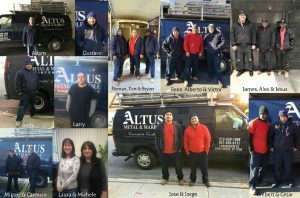 Altus Metal, Marble and Wood just celebrated its 28th year in business! February, a time of showing appreciation, is the perfect month to offer thanks to the people who make it all possible. We are well aware that no matter how grand a vision and noble the goals, if a company doesn’t have wonderful people behind it, it will not succeed. The Altus team is a mix of individuals who have been with us for over 20 years and young apprentices who show great potential and are eager to learn. The members of our crews and staff have made us the successful, respected company we are today. Every time I walk through my office or go to one of the job sites where Altus’ skilled tradesmen are hard at work, I am filled with pride. The work done by our restoration specialists in ornamental metal, natural stone and natural wood, demands great artistic talent and craftsmanship as well as painstaking care, dedication and patience. It requires individuals who don’t want just to acquire a skill, but to master the process. To all our crews, we offer our deep gratitude. To the team who runs the office with great efficiency, and always manages to keep a cool head even at moments of stress, we extend our warmest thanks for your devoted service. It’s clear to us – great things DO happen- if you care.